The huainanzi (淮南子), variously translated as “The Masters of Huainan”, “The Huainan Philosophers” and “The Book of the Master of Huainan”, is an ancient Chinese philosophical work on the proper way for a monarch to govern. The huainanzi also records some of China’s most ancient myths and stories including “Nu Wa Repairs the Sky” (nu wa bu tian 女娲补天), “Hou Yi Shot the Suns” (hou yi she ri 后羿射日), “Chang’e Flies to the Moon” (chang e ben yue 嫦娥奔月), and “Yu the Great Tames the Flood” (xia yu zhi shui 夏禹治水). Liu An (刘安), the Prince of Huainan, was a grandson of Liu Bang (刘邦), the founder of the Han Dynasty, and also the uncle and adviser to Emperor Wu (武帝). He, together with a gifted group of literary scholars known as the “Eight Immortals of Huainan” (淮南八仙), wrote this major treatise which he then presented to Emperor Wu in 139 BC. To be successful, according to the huainanzi, a ruler should embrace both Daoist and Confucian principles. The monarch should adopt the practice of self-cultivation with the goal of attaining sagehood. At the same time, he must actively engage in the mundane and practical activities of government administration. The huainanzi established the proper way for a king to rule and its influence spread to neighboring countries including Vietnam, also known as Annam. The large Vietnamese presentation coin displayed here has the inscription Minh Mang Thong Bao (Chinese: ming ming tong bao 明命通宝) which was used on coins cast during the reign (1820-1840) of King Nguyen Thanh To of the Nguyen Dynasty. Because minh mang (明命) has the auspicious meaning of “intelligent decree” or “bright life” (明命), the inscription can also be found on Vietnamese charms and amulets. 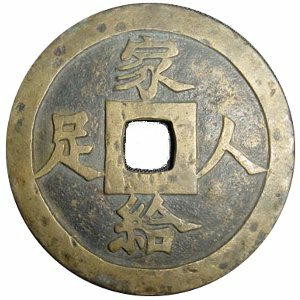 The inscription on the reverse side is jia ji ren zu (家给人足). According the the huainanzi, an enlightened ruler should strive to ensure that the common people have the basic necessities. In so doing, the people will live in contentment and the country can be at peace. This large Vietnamese cash coin has a diameter of 48 mm. Although no denomination is stated, these coins were valued at the equivalent of one hundred small cash coins. 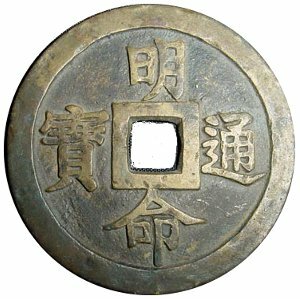 These large and well-made Minh Mang Thong Bao presentation coins are famous for their inscriptions based on the Chinese classics. There are at least seventeen known varieties with a four-character inscription and twenty-three known varieties with an eight-character inscription.